its called Bitcoin. Satoshi Vision. oy vey goys, do NOT read this! I urge you do not listen to one word Faketoshi says or bad things will surely happen to you. >forbidding any cash value of the Google Play Credits. thanks. they can't keep getting away with this. >Expect to be living in a barrel when we finish with you. Bitcoin SV is, dare I say it, the Final Solution. >I can't believe anyone would buy a coin made by this guy. I can't believe anybody isn't already all in. okay so heres the crypto red pill. nazis created bitcoin during WW2 and hitler is currently living inside the blockchain. craig s reich realized this and is in the process of "forking" (Machtergreifung) the chain so hitler can be freed. once freed hitler can literally invade every computer in the entire world. the National Bank of Germany (NBG) already knows this and is making preparations for. the war will be fought on computers and over the blockchain, not on the ground. 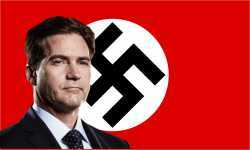 craig reich has been hand chosen as the Nazi minister/chancellor in human form. okay so heres the crypto red pill. nazis created bitcoin and hitler lives inside the blockchain. craig s reich realized this and is "forking" (Machtergreifung) the chain.